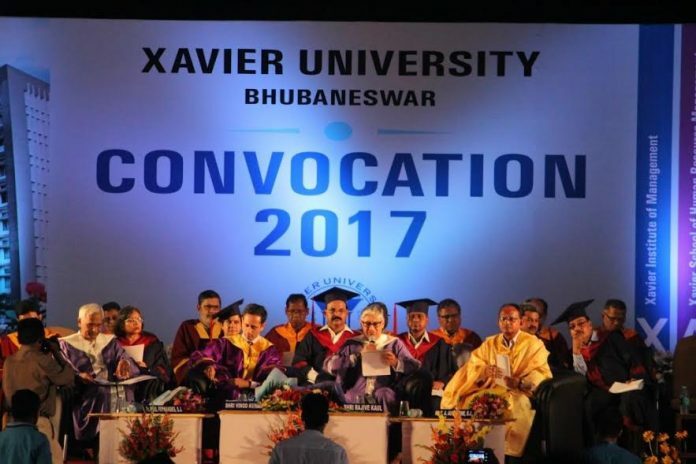 Bhubaneswar: Xavier University, Bhubaneswar (XUB), one of the premier Universities of India, held its3rd Convocation on 22nd March 2017. The Vice Chancellor, Fr. Paul Fernandes in his address to the audience elaborated the achievements of Xavier University Bhubaneswar. Xavier University Bhubaneswar (XUB) is a globally recognized University of repute delivering quality management education to the students from the world over. He said, in its endeavor to take up the tasks which are bold but necessary and which hitherto nobody has taken up, the Xavier City Campus of the Xavier University was inaugurated on July 7, 2014. Presently it hosts six Schools of management education offering Doctoral, Masters and Under-graduate programmes and more and more schools will be added each year. History was made in October 1987 with the establishment of XIMB (Xavier Institute of Management Bhubaneswar), Xavier University’s flagship management institute which, over the past 30 years has been recognized as a premier Business School in the country. It aspires to lead the country in management education by focusing on research and innovation. Its intellectual capital rankings have been in the top five in the country consistently.